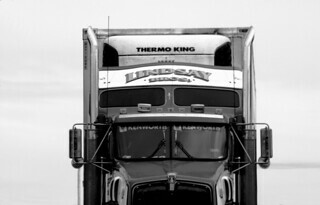 If you’ve ever felt the pull of the open road, this is an excellent time to consider a truck-driving career. Trucking added the most jobs of any transportation sector in February 2013, increasing its employment by 5,600 positions, according to the U.S. Labor Department. The demand for commercial truck drivers is expected to grow by 21 percent through 2020, according to the U.S. Bureau of Labor Statistics. Tanksley sees that demand from the 30 companies that actively recruit his students. A bill moving through the state legislature would waive the commercial driver’s license skills test for new veterans who drove trucks in the military. Under the proposed law, veterans would have to apply for the waiver within 90 days of leaving service. A written test would still be required. Supporters say the bill would help veterans find employment and address a shortage of commercial truck drivers. The law already waives the skills test for active duty soldiers. “I’m always on the lookout for things to help soldiers,” said Rep. John Szoka, a Cumberland County Republican, who introduced the bill that cleared the House on April 9. Szoka, himself a veteran, said he expects the bill to pass the Senate and go to the governor this week. From his seat 10 feet above Interstate 45, trucker Gary Babbitt takes a lofty view of the business he loves. Big rigs haul virtually everything in the U.S. to consumer markets, he says, from milk to medicine to Mercedes-Benzes. These days, the pulse races — mostly from stress. Thousands of experienced baby boomer truckers like Babbitt are near retirement in a business already grappling with a long-term 10 percent shortage of drivers. And the industry continues to struggle to attract young drivers who could fill some of those empty seats. As the economy slowly improves, driver shortages may slow the shipment of goods everywhere, pushing freight prices higher as well. “What you’re describing is a long-term problem with no short-term solution in sight,” said John Esparza, president and CEO of the Texas Motor Transportation Association.